Virgin Hotels has arrived and we’re here to wake up the world with smarter alternatives for travellers. For years many hotels have provided services and facilities that are tired and lack excitement, customers are being nickel and dimed and the most basic comforts are being ignored. But that has all changed now. Each hotel will intermix a passion for food and beverage, music and culture, fusing along with the local landscape and providing a vibrant and inclusive environment for travelers and locals alike. Virgin Hotels Chicago, which was named the "​#1 Hotel in United States"​ by Conde Nast Traveler's Readers'​ Choice Awards 2016 and "​#1 Hotel in Chicago"​ by Conde Nast Traveler's Readers'​ Choice Awards in both 2016 and 2017, is now open and accepting reservations at virginhotels.com/chicago. Virgin Hotels San Francisco to open 2018, be the first to stay, reserve now at virginhotels.com/san-francisco. Locations in Nashville, Dallas, Washington, D.C., New Orleans, New York, Silicon Valley, Palm Springs, Las Vegas, Edinburgh and others are to follow. No Nickel & Diming Policy: All Virgin Hotel visitors can access Unrestricted bandwidth WiFi at no cost, hassle free late checkout, no cancellation fees. Hotel guests can also take advantage of the mini-bar street pricing and can sip on complimentary cocktails and wines during nightly happy hour (time may vary at each hotel) aptly dubbed the Spirit Hour when becoming a member of The Know at Commons Club. One-of-a-kind beds: All chambers have the brands custom designed and patented bed that features an ergonomic designed headboard and erectable footboard. Unique Chamber Design: All chambers consist of two rooms: the first “The Dressing Room”, which combines the hallway, and a luxurious dressing area which includes a full vanity, make-up desk and well-lit mirror, an extra-large shower with a bench, and his and hers closets designed by Poliform®; the second “The Lounge”, which consists of our patented designed bed, ideal for working, recharging, wellness and playing. A red SMEG® mini-fridge stocked with street-priced comforts, LG Smart TV, Bluetooth audio tower, yoga mat, a custom designed table with task chair and ample outlets for smartphone, laptops or other electronic devices. All chambers feature custom lighting on sensors which automatically illuminate when guests move. Virgin Hotels App – Lucy: Order room service, control room temperature, make dinner reservations, request your vehicle from valet, even live chat with your concierge and other guests via the mobile app. Commons Club: Commons Club is Virgin Hotels’ flagship food & beverage concept. This dynamic space will be in all Virgin Hotels, and serves as a cocktail retreat, restaurant, workstation and more. A new take on the modern social club. The space transitions seamlessly from morning to night, where productivity and ever-present connectivity blend with inventive libations. Designed to support diverse traveler’s needs while providing an active scene for locals, Commons Club is the perfect venue to dine, sip, work and play. The Kitchen, located within each of the Commons Club features local culinary talent preparing daily fare for breakfast, lunch and dinner in a lively atmosphere. 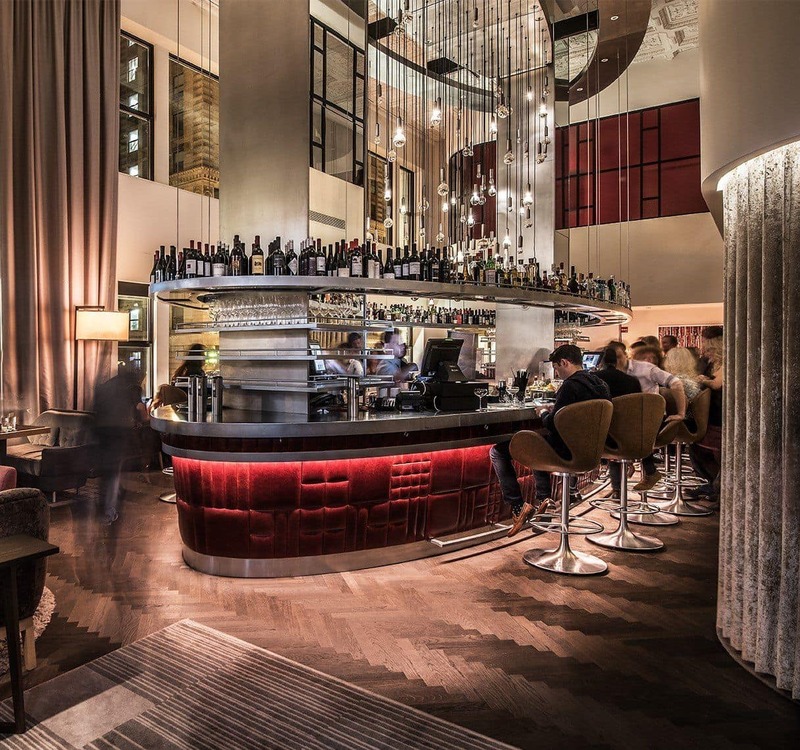 The Bar, a beautifully designed centerpiece offering creative drinks. The Shag Room an intimate space also located within the Commons Club welcomes all visitors to be social and sip on crafted cocktails. The Know: Membership without dues. That’s the feeling you get when you join The Know. That means Room Upgrades, the best Rate Discounts and special Dining Offers in The Commons Club when you book directly with Virgin Hotels. You’ll also have exclusive access to The Spirit Hour, when cocktails are on us at Commons Club. The more you let us Know, the more we can pander to your every desire and Personalize Your Stay.